Hearthstone: The Witchwood: New Hunter Legendary Dragon card revealed, Emeriss – AiPT! 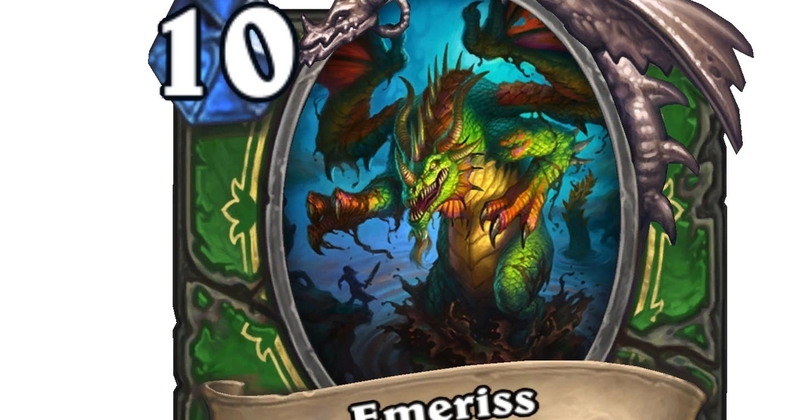 Presenting Hearthstone’s first ever Hunter Dragon: Emeriss. Who knew one of the four Dragons of Nightmare would turn out to be a Hunter Legendary? Card text: Battlecry: Double the Attack and Health of all minions in your hand. Will this card feature a special emote when facing Tyrande Whisperwind? Is Control Hunter/Dragon Hunter (or should that be Meme Hunter?) on the menu for The Witchwood Ranked ladder? Time will tell. Although, I can’t deny how satisfying it’ll be to run a 16/16 King Krush on Turn 11.